Blog from July, 2011 - Producer Exchange - PBS Documentation Home for your Wiki! Thanks to all for joining us on Tuesday’s Webinar: SEO Basics ~ Refresher. A copy of the Deck is now available and can be downloaded below. There were good questions asked throughout the webinar, and we hope to keep the conversation going. Please use the comments section below to ask any follow-up questions, and do let us know your thoughts on the new webinar format where we integrated your questions throughout the presentation. Today PBS launched a sneak preview of PBS Food. The PBS Food content channel will serve as a centralized web experience for food and cooking content from across the PBS system. The goal of the content channel is to better aggregate and promote such content in order to drive traffic to national and local content. The launch today is considered “Phase 1” with a complete launch in Phase 2 expected by the end of summer. Phase 1 predominantly focuses on the “Fresh Tastes ” blog authored by two well-known food bloggers: Jenna Weber and Marc Matsumoto. Marc Matsumoto is a food blogger and photographer who spreads his passion for food through his websites norecipes.com and wanderingcook.com . For Marc, food is a life long journey of exploration, discovery and experimentation and he shares his escapades through his blogs in the hopes that he inspires others to find their own culinary adventures. Marc’s been featured in the New York Times, Wall Street Journal, and USA Today, and has made multiple appearances on NPR and the Food Network. Jenna Weber graduated from Le Cordon Bleu in 2008 and, since then, has worked as a pastry chef, bread baker and freelance food editor. Currently, Jenna blogs full-time on EatLiveRun.com where her delicious daily recipes and quirky culinary musings appeal to thousands. She lives in Northern California and, when not in the kitchen, can usually be found on her yoga mat. Help Promote PBS Food and "Fresh Tastes"
Anyone who would like to promote PBS Food and “Fresh Tastes” via their own social media handles, feel free to use the following suggested phrases. Is Your Cooking Program Listed? 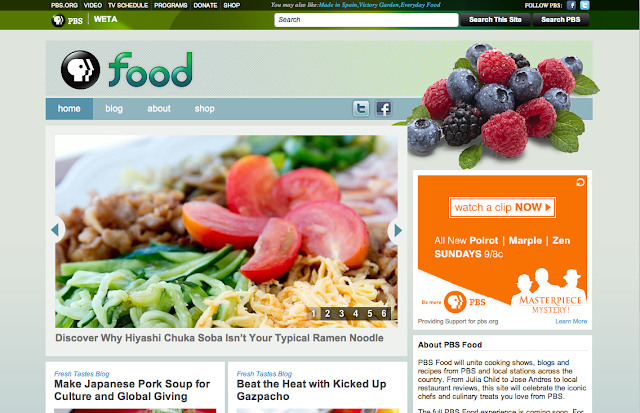 Starting with Phase 1, PBS Food will regularly feature promotion of station food content in both the main homepage carousel and homepage modules. The Food team has thoroughly researched station content, but we welcome content suggestions from all stations and programs. Phase 1 also includes a featured list of station food programs – if we have neglected any programs from this list, then please alert the Food team asap. Immediately following the launch of Phase 1, the Food team will continue our aggressive development calendar to launch Phase 2. PBS will perform maintenance on internal databases this coming Wednesday, July 27, from 10am to noon ET. Producers and end users should see no noticeable impacts, and Amazon instances will be completely unaffected. Please reach out to your program manager if you have any questions. PBS Arts Online has been an experiment since day one. Some things have worked better than others. We have tried a unique design look and feel for PBS. We’ve mixed national broadcast content with local content (even some from the archive!). We have collected video stories and imagery from users. Our content ranges from ballet to street art, symphonies to rock and roll. It is easy to say that it feels a bit schizophrenic at times, but we have learned one important lesson: PBS Arts seems to be very popular in the social space. This has remained consistent since our launch one year ago. Because of our success in the space (on Facebook in particular), PBS Arts is toying with the idea of largely moving to the social space for content distribution. On July 20th, PBS Arts launched another experiment: a web-only series called Off Book that explores experimental and cutting edge art. The 13-episode series includes episodes on light painting, collective imagery, and steampunk, among others. We will release a new episode every other week. If you clicked on the Off Book link above, you may have noticed another experiment in the works. The premiere episode appears on YouTube. The episode also appears on Tumblr and Vimeo (and the PBS Arts site, powered by COVE). We will be promoting the series on Facebook, Twitter and interested blogs, using a combination of the PBS Arts site link and the YouTube link, to test the success rates using different platforms and their sharing capabilities. In a few weeks, I’ll provide a case study of the dual linking trial, to see how the PBS audience (and a new audience that we are hoping to build on Tumblr and Vimeo) reacts to the video in different places. Please leave any comments or questions in the thread below or feel free to reach out to me directly at lssaks@pbs.org. PBS pushed out a minor update to the old global hat/header that lives on Producer sites and the Video Portal today. Please note this has been rescheduled and will now take place exactly one week later than previously stated. It will now occur on Friday July 22nd at 7 pm PST and the same description below will apply. As always please inform us of any questions or concerns. Disqus will undergo maintenance on its master database server this Friday between 7-8pm PST. During this maintenance window, Disqus will be in read-only mode and users will be able to read but not make comments on discussion threads. The maintenance window is from 7-8PM PST, however, all work is expected to be complete within 15 minutes. We will keep you informed of any additional updates. Please let us know if you have any questions or concerns. Why does Google hate my site? Why are my well-ranked pages not driving noticeable traffic? Is it true that keywords don't matter anymore? Do outbound links hurt my search engine rankings? Bring these questions and more to our next webinar on Tuesday July 26, 2011 from 2 – 3pm ET. PBS New Media Director, Melanie Phung, will lead a refresher course on SEO Basics and Best Practices. This is a great session for those who missed last summer’s webinar or would like a quick refresher and opportunity to ask questions. PBS is experimenting with Google+ and wants to know what you think if you’ve been able to take a look. Haven’t heard of the new social site yet? Don’t worry. You’re probably not alone. Testing has been limited to a small trial group and has not been opened to the larger public yet. There are some interesting new features-- like the ability to segment your friends in “circles” and follow people who don’t follow you back. Or have your Google+ account select the videos and articles that it thinks will interest you most. Did we mention video chat (known in Google+ as a Hangout)? Bonus! This is important: All brands have been asked to hold off on creating Google+ profiles. So, please wait before creating your PBS-related presence in the new tool. More detail . Have an opinion? We’re interested to hear what you think and how you envision your site using this tool in the near future. Please leave your comments below. And don’t forget to place your vote about Google+ on Media Shift’s new poll . A while back, Google announced support for a few new meta tags related to article attribution. And here's another quick overview of how to implement these tags and what they look like in the SERPs.